As many of you know, a few months ago our previous Artistic Dir. Arthur Mitchell passed away. We grieved his passing, but celebrated his amazing life. Renee and I both realized just how fortunate we were to have worked with a man who truly understood the power of the Arts to change individual lives and the greater world itself. That good fortune comes with a price and that price is to share what we have learned and to carry on with the mission. Mr. Mitchel always told us “that there is something greater than yourselves” to work towards and to strive for. Renee and I have embraced our legacy and have had the good fortune of collaborating with Artistic Dir. Lois Ellyn and The Nouveau Chamber Ballet for the past few years. She is a another direct descendant of George Balanchine and is an incredible woman! When she asked us to undertake the organization of this Summer Program we were honored but also hyper aware of the challenges. Happily, with the help of some incredible volunteer staff we have made some tremendous progress and are putting the finishing touches on the schedule and locking down our amazing faculty who have been so generous with their time and willingness to fit us into their schedules. So if you would like to help with a donation no amount is too small. But we know that the struggle is real!!! So if you can’t donate at this time please spread the word about the Summer Intensive and this Go Fund me. FYI: I will update you all with the recipients of the scholarship as we reward them. Thank you for your support. Hi you lovely people you! We have our 6th donation and are really beginning to hit our stride. 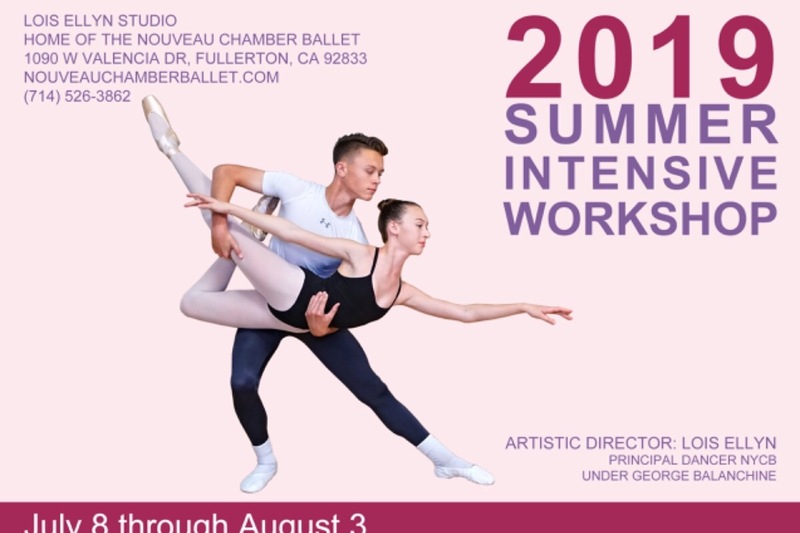 With the summer program a few months away, Renee and I would love to be able to offer a few more aspiring dancers a chance to attend the Nouveau Chamber Ballet Summer Program. Every single dollar and cent will be used to pay for a portion of a young dancers tuition. Whatever you can manage would be greatly appreciated and no amount is too small. Thank you for supporting the ARTS!!!! The quote above is from my beloved and recently passed Artistic Director. The meaning continues to grows as I grow into wisdom. As many of you know. I started my dance training very late, in my early twenties to be exact. You know that classic tale of, boy meets girl, girl is a dancer, girl tells boy to audition with her for the school show and boy shows up in surf trunks and a wife beater and somehow gets chosen to be in the show" and the rest is history. To say "Dance saved my life" it is not far from the truth. I can't imagine my life without Dance...I met and married my wife, traveled the world, made incredible friendships and I have been able to contribute to a better world through this art-form. That is why both Renée and I are teaching now, because it's our turn to give back and share in the bounty that has been shared with us. So thank you to all that have donated so far, you are helping make this world a better place. Dancers represent the possibilities of the human body, the hope that springs eternal, the human spirit at its finest and that is much larger than any one person. This is what we hope to teach the next generation and with your donation we can achieve it. Exciting news! So far we have 3 generous donations to our fundraiser. I can feel the momentum building as we prepare for our Summer Program. If you are able to donate wonderful! If you are not, but would like to help then that is wonderful too. We appreciate any assistance be that dollars or simply sharing this fundraiser with your friends. More updates to come!